“Übungen zur Freiheit” (Exercises on Freedom) was created for the solo exhibition “How to do things with Words” by Hannes Egger at the MEWO Kunsthalle in Memmingen. The artist investigates references to freedom in the city. His starting point is the exhibition buildings themselves, which were badly damaged during a bombing raid in July 1944. In his audience performance, Hannes Egger interweaves the 12th article of the Memmingen farmers articles from 1525 with the stories of the displaced people who came to Memmingen in the immediate post-war period, today’s asylum seekers, the concept of freedom in the work of Jean Paul Sarte as well as David Hasselhoff who came to Memmingen in 1992 and was famous for his song “Looking for Freedom”, which many in Germany understood as a hymn to the fall of the Wall. 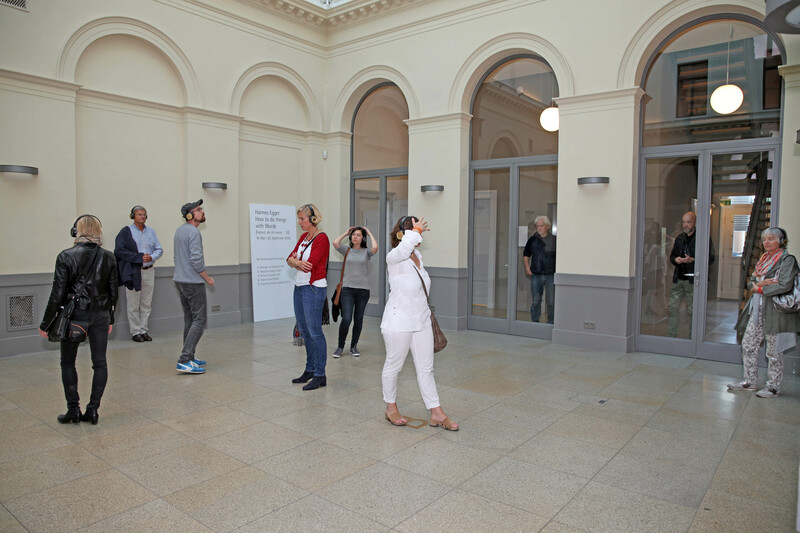 Hannes Égger’s headphones serve as a device to turn visitors into performers during “Exercises on Freedom”. A narrative voice accompanies the piece, which lasts a good 17 minutes, asking questions, reminding, making connections and demanding performance actions such as dancing or pressing your face against a window.